More rain and flooding has been forecasted in Iran while flood waters still engulf some areas in Golestan 10 days after deadly floods ravaged the northern province. According to Iran’s Meteorological Organization, the north, west and some areas in central Iran will witness more severe rain in the next three days. According to the state-run ISNA News Agency, thunderstorms will lead to the overflowing of rivers and flooding. Quoting the head of the Meteorological Organization, the news agency also said that from Sunday afternoon to Monday, rain will probably lead to flooding in the provinces of Zanjan, Qazvin, Tehran, western parts of Semnan and the northern province of Gilan. Other news agencies also warned of severe rains in the western provinces of Lorestan and Markazi. 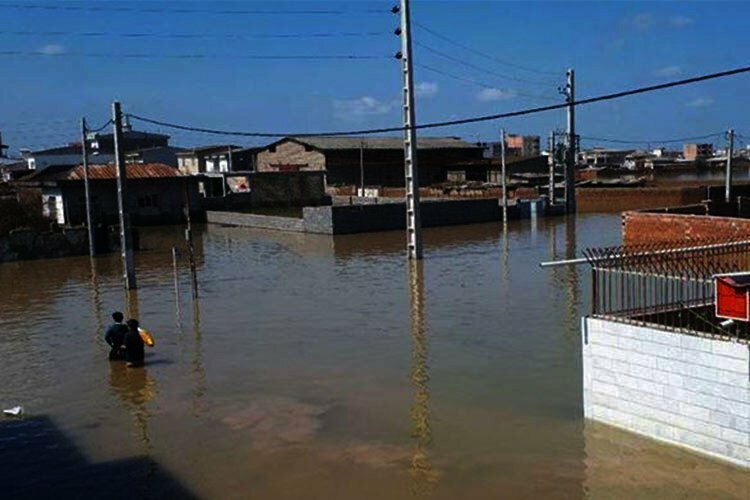 Ten days after lethal floods in the northern town of Aqqala, flood waters have still engulfed large areas of the town with reports of local officials saying they had to wait for the water to “vaporize”. According to local reports, flood stricken residents complain that the government has done little or nothing to aid them. They say that the little aid they have received has been from the public. Earthquake survivors in Kermanshah W #Iran,are sending aid to the survivors of the North floods. Locals also say that Iran’s Red Crescent, linked to the Iranian regime, has warned the public that any independent aid that is not carried out through the government would lead to arrests. According to local sources, #Iran's red crescent have warned that nobody has the right to collect and send any aid for the flood victims independently. Anyone who does, will be arrested. Residents of flood stricken areas also complain and sometimes ridicule officials who go to flood sites with camera crews and record their visit without taking any concrete measures in terms of flood relief. Videos on social media also show locals looking for bodies of the decreased in the water with no government teams in sight. The number of victims of #IRANFLOO is not real, and Iran regime is lying. Another video shows a young mother in the south central city of Shiraz saying that she did not have diapers and clothes for her baby. “We don’t have any warm clothes for the nights and we freeze,” she says. Another woman standing next to her says that no government institution has given them aid and that all the aid they have received has been from the people. “My son is sick. His eyes are infected, but they don’t bring any medicine for him. His leg has become infected, but they don’t bring any ointment,” the young mother says. Locals and eye witnesses have reported that more than 150 people died during the lethal flash floods in Shiraz while the government has announced that only around 19 people lost their lives. Another video shows the head of the crisis management organization in the southern province of Khuzestan trying to persuade farmers to allow flood waters to be directed to their lands as the farmers shout out and protest. “We don’t have any bread,” one man cries out addressing the cleric and official.